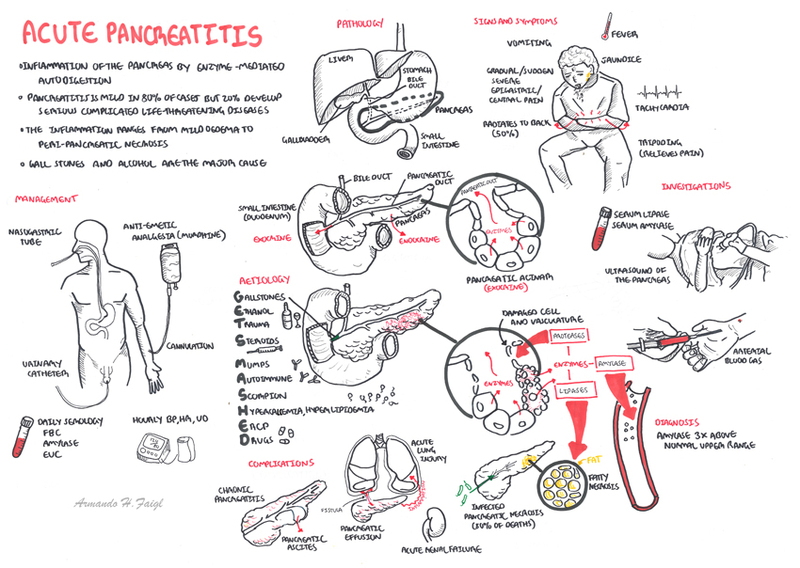 Summary of acute pancreatitis This is a relatively common serious cause of abdominal pain in the middle aged and elderly. Often due to gallstone and alcohol. Clinical presentation is often severe constant epigastric pain radiating to the back. Serum amylase and lipase are one of the most important tests for suspicion of acute pancreatitis. Treatment is conservative and nil by mouth. 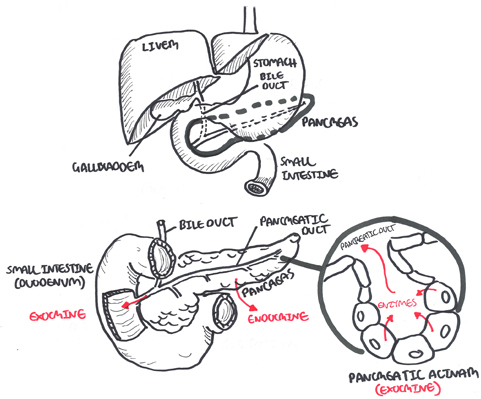 Overview Acute pancreatitis is a relatively common condition presenting with severe, acute, constant epigastric pain. Incidence of ~5 per 100,000/year. Acute pancreatitis has a significant mortality. 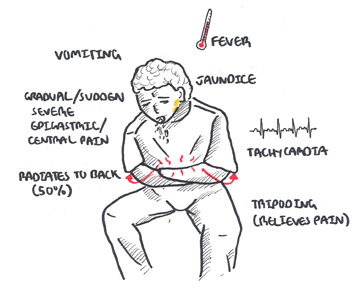 Early complications include acute renal failure, DIC, hypocalcemia and ARDS. Acute Pancreatitis: An inflammatory process in which pancreatic enzymes are activated and cause autodigestion of the gland. Pancreatic pseudocyst: Cystic space within the pancreas not lined by epithelial cells, often associated with chronic pancreatitis. The head is encircled by duodenum and tail in contact with spleen. Pancreas has a poorly developed capsule & therefore adjacent structures (common bile duct, duodenum, splenic vein, transverse colon) are commonly involved in inflammatory process. Investigations Serum amylase and lipase are diagnostic. Serum lipase remains elevated for longer then serum amylase and is more specific, but less sensitive. Other investigations include CRP (elevated), FBC, LFT (show abnormality), EUC and serum glucose. Abdominal x-ray can be performed but often show un-specific findings. CT may be required (shows pancreatic oedema, haemorrhage and necrosis). Ultrasound scan must be done within 48hours of admission to identify gallstone in the bile duct. Acute onset of persistent, severe, epigastric pain often radiating to the back. Elevation in serum lipase or amylase to 3 times or greater than the upper limit of normal. Characteristic findings of AP on imaging (CT, MRI, transabdominal ultrasound). Albumin – Increased protease leads to albumin breakdown and shift of albumin to interstitium cause of increased in permeabiliy. Pathophysiology Inflammation of pancreas results in cell death. 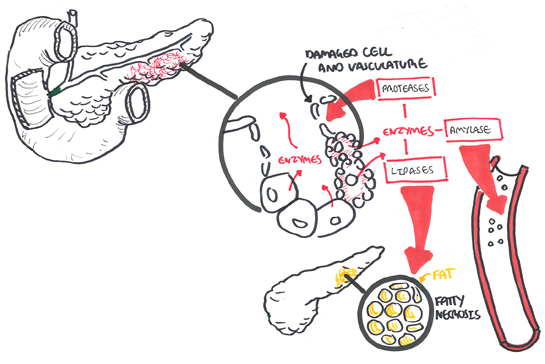 The pancreatic cells release its enzymes everywhere resulting in further pancreatic inflammation. The enzymes self-digests the pancreatic tissue. Lipase and amylase levels are increased in the blood. Treatment of pancreatitis is mainly supportive and includes “pancreatic rest”. Withholding food or liquids by mouth until symptoms subside, and adequate narcotic analgesia, usually with meperidine. Management Conservative treatment involves oxygen, obtaining IV access for IV fluids and collecting bloods. 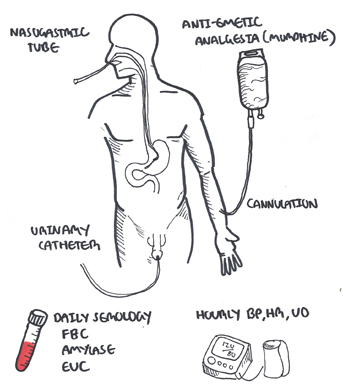 IV analgesia + antiemetic. Nil-by-mouth and provide and nasogastric tube. Insert urinary catheter and monitor urine output hourly. Also monitor blood pressure and heart rate. Consider early insertion of a central venous line to monitor central venous pressure and guide IV fluid therapy in the seriously ill particularly the elderly. Complications Acute pancreatitis has a significant mortality. Early complication include acute renal failure, disseminated intravascular coagulation (DIC), hypocalcemia, respiratory distress. late complications include pancreatic abscess or pseudo abscess and fat necrosis. Necrosis may be sterile or infected. 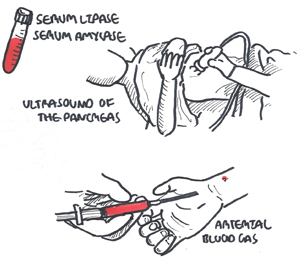 Haemorrhage may occur and result in Cullen’s sign (periumbilical eccymosis) on 5% of cases. If risk factors for pancreatitis is not changed, chronic pancreatitis may result long-term. Continuous pancreatic inflammation may develop into full blown MODS or SIRS. Prognosis Mortality is associated with pancreatic necrosis and the presence of sepsis.